This is the best mature Evangelical treatment on the subject. Conservative evangelicalism faces a schizophrenia on this topic. On one hand, they know that the demonic and occultic exist because the Bible says so and modern experience is becoming almost overwhelming. On the other hand, they tend to write this off as charismatic kookiness and with the view that spiritual gifts have ceased today, they really don’t know what to make of this indisputable phenomenon. 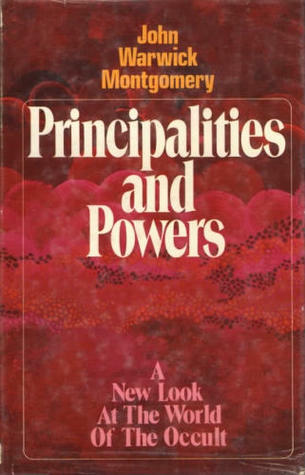 Montgomery approaches with a relatively open mind. He resists the urge to write off all of the paranormal as demonic. He introduces a key distinction: we must separate the fact from the interpretation of that fact. He also points out where individuals find themselves with ESP-like abilities in situations that are neither angelic nor demonic. He does move his analysis into the occult, however. He gives a brilliant summary of the history of occultism and Cabalism. He has a fascinating analysis of how to interpret “ghosts” (for lack of a better word). All the while he remains faithful to biblical revelation on the afterlife. He ends with a humorous, if quite interesting, fictional short story of a liberal minister who becomes convinced of the demonic. This is from James KA Smith’s earlier days, before he became NPR’s token Christian thinker. This book is actually good, which pains me to say. Smith seems unbalanced in many ways since writing this book. I think it is Trumpphobia or something. Thesis: Pentecostal worldview offers a distinct way of being-in-the-world (Smith 25). Embodied practices carry within them a “tacit understanding” (27). Is a Pentecostal Philosophy Possible? radical openness to God, or God’s doing something fresh. An “enchanted” theology of creation and culture. Smith means that we see reality not as self-enclosed monads, but realizing that principalities and powers are often behind these. this entails spiritual warfare. I cringe at terms like “enchanted” because it’s more postmodern non-speak, but Smith (likely inadvertently) connected “enchanted” with demons, which is correct. A nondualistic affirmation of embodiment and spirituality. Smith defines “dualism” as not denigrating materiality. Fewer and fewer Christians today do this, so I am not sure whom his target is. Even chain-of-being communions like Rome that officially denigrate embodiment say they really don’t mean it. Eschatological orientation towards mission and justice. Some hermeneutics: Smith rightly notes that “The Last Days” (per Acts 2) is connected with “today” ( 22; we accept this model in eschatology but abandon it in pneumatology). Smith wryly notes that Acts 2:13 is the first proto-Daniel Dennett hermeneutics: offering a naturalistic explanation for inexplicable phenomena (23). Following Martin Heidegger, Smith suggests two kinds of knowing: wissen and verstehen, justified, true belief and understanding. The latter is tacit and is at the edges of conscious action. Per the dis-enchanted cosmos, Smith astutely points out that “There is a deep sense that multiple modes of oppression–from illness to poverty–are in some way the work of forces that are not just natural” (41). In other words, spiritual warfare assumes a specific, non-reductionist cosmology. While I found his chapter on epistemology inadequate, he does say that we know from the “heart” as embodied, rational beings (58). This isn’t new to postmodernism, but is standard Patristic epistemology. This section could have been interesting. Smith wants to argue that pentecostalism sees an open ontology that allows the Spirit to move from within nature, rather than a miracle that is “tacked on” to nature from the outside. He makes this argument because he wants pentecostalism to line up with the insights from Radical Orthodoxy. I have between 50-75 pentecostal relatives who “embody pentecostal spirituality.” I promise you that none of them think like this or are even capable of thinking like that. I do not disparge them, simply because I am not to sure Smith’s project at this point is really coherent. He wants to reject methodological naturalism (rightly) but argues for his own version of supernatural naturalism. If Smith is successful, then he can show that pentecostalism lines up with quantum mechanics. Okay. Thus, nature is “en-Spirited” (103). While I have problems with his “suspended materiality” ontology, Smith makes some interesting points: miracles are not “add-ons.” They are not anti-nature, since “nature is not a discrete, autonomous entity” (104). That’s good. I like it. We are considering “tongue-speech” as a liminal case in the philosophy of language (122). Exegetical discussions are important (and ultimately determinative), but we can’t enter them here. Smith wants to argue that tongues (T₁) resists our current categories of language and emerges as resistance to cultural norms. I think there is something to that. There is a difference between signs as expression (Ausdruck) and those that do not mean anything (indications, Anzeigen). Ausdruck is important as it means something, whereas Anzeigen serves as a pointer (127, Smith is following E. Husserl). Husserl even notes that there can be signs that are not Ausdrucken nor Anzeigen. This turns on the question: can signs which do not express anything nor point to anything be modes of communication? As many critics of Husserl note, his account of speech links communication with intention, so he has to answer “no” to the above question. Or maybe so. What kind of speech can there be that is not bound up with inter-subjective indication? Husserl (and Augustine!) suggest the interior mental life. Thus, signs in this case would not point to what is absent. Utterances (of any sort) are performative. While such utterance-acts do convey thoughts, sometimes their intent is far more. Let’s take tongues-speak as ecstatic, private language. What does the pray-er mean to do? We can easily point to an illocutionary act of praying in groans too deep for words. We can also see a perlocutionary act: God should act in response. Oh boy. Smith wants to say that tongues is a speech-act against the powers that be. I like that. I really do. I just fear that Smith is going to mislocate the powers. He begins by drawing upon neo-Marxist insights (147). However, without kowtowing fully to Marx, he does point out that Marx has yielded the historical stage to the Holy Ghost. Tongues-speech begins as “the language of the dispossessed” (149). This, too, is a valid sociological insight. The chapter ends without Smith endorsing Marxism, which I expected him to do. While we are on a charismatic high, I will exercise my spiritual gift of Discerning the Spirits.” The reason that many 3rd World Pentecostals are “dispossessed” is because they are in countries whose leaders serve the demonic principality of Marxist-Socialism. Let’s attack that first before we get on the fashionable anti-capitalism bandwagon. *Smith, as is usual with most postmodernists, gets on the “narrative” bandwagon. There’s a place for that, but I think narrative is asked to carry more than it can bear. In any case, it is undeniable that Pentecostals are good storytellers. Smith wants to tie this in with epistemology, but he omits any discussion from Thomas Reid concerning testimony as basic belief, which would have strengthened his case. Smith (rightly) applauds J. P. Moreland’s recent embrace of kingdom power, but accuses Moreland of still being a “rationalist” (6 n14, 13n26). Precisely how is Moreland wrong and what is the concrete alternative? Smith criticizes the rationalist project as “‘thinking’ on a narrow register of calculation and deduction” (54). Whom is he criticizing: Christians or non-Christians? It’s not clear, and in any case Moreland has come under fire for saying there are extra-biblical, non-empirical sources of knowledge and reality (angels, demons, etc). Smith then argues that all rationalities are em-bodied rationalities. That’s fine. I don’t think this threatens a Reidian/Warrant view of knowledge. Perhaps it does threaten K=JTB. I don’t know, since Smith doesn’t actually make the argument. Smith makes a good argument on the “heart’s role” in knowing, yet Moreland himself has a whole chapter on knowing and healing from the heart in The Lost Virtue of Happiness (Moreland 2006). Smith elsewhere identifies aspects of rationality as the logics of “power, scarcity, and consumption,” (84) but I can’t think of a serious philosopher who actually espouses this. Elsewhere, Smith says Christian philosophy should be “Incarnational” and not simply theistic (11). What does that even mean? Does it simply mean “Begin with Jesus”? Does it mean undergirding ontology with the Incarnation, per Col. 1:17? That’s actually quite promising, but I don’t think Smith means that, either. So what does he mean? Is Smith a coherentist? I think he is. He hints at good criticisms of secularism, but points out “that the practices and plausibility structures that sustain pentecostal (or Reformed or Catholic or Baptist or Moonie–JBA) have their own sort of ‘logic’,” a logic that allows Christians to play, too (35). But even if coherentism holds–and I grant that Smith’s account is likely true, it doesn’t prove coherentism is true. All coherentism can prove is doxastic relations among internal beliefs, but not whether these beliefs are true. Of course, Smith would probably say I am a rationalist. In his desire to affirm materiality, Smith seems to say that any religious materiality is a good materiality. Smith approvingly notes of Felicite’s clinging to feasts and relics (36). It’s hard to see how any one “Materiality” could be bad on Smith’s account. But this bad account is juxtaposed with some good observations on the book of Acts (38) and tries to connect the two. *Smith says that “postmodernism takes race, class, and gender seriously” because it takes the body seriously (60). This is 100% false. If facebook is a true incarnation (!) of postmodernity, may I ask how many “gender/sexual preference” options facebook has? I rest my case. *Smith doesn’t miss an opportunity to criticize “rationalism” for separating beliefs and faith/practice, yet Smith himself seems mighty critical of those who focus on “beliefs” in their philosophy of religion (111). Sure, most post-Descartes philosophy of religion is overy intellectual, but I do think the Reidian/Plantingian Epistemology model, integrates belief and faith-practice. ***the bible never calls the gifts “sign gifts”. Rather, it calls them “charismata”, or quite literally “grace gifts”. This alone shatters the cessationist position that the gifts were only meant to be temporary “signs” until the cannon was complete. Also, the fact that the bible commands us to “eagerly desire” the charismata, and even goes so far the equate “despising prophecy” with quenching the spirit. The fact that the church in Corinth was abusing the gifts and yet Paul never rebukes them for practicing the gifts, or mentions them ceasing. Rather, he corrects their usage of the gifts and then encourages them to continue in the practice of them. Also, the fact that there are multiple cases in the bible itself which gives examples of people prophecying and yet, none of the prophecies are written in scripture, thus detrying the “all prophecy is equal to scripture” fallacy. For cessationists to be consistent they would need to somehow dig up all the prophecies which are spoken of in the bible, but not recorded in the bible, and add them to the cannon. *** Paul’s body dynamic argument in 1 Corinthians 12, that all the members of the body are necessary. ***The “perfect” never refers to the canon. So when people make the claim, “Our church has remained unchanged in its practice and liturgy from the earliest days,” ask them if they speak in tongues. Then ask which churches today speak in tongues. Adv. Hær. V. 6. 1. I haven’t done a real blog post in a while, mainly book reviews. And this post is from a book, but to include it in a formal review will make it unwieldy. Note, in saying these are false assumptions in cessationist arguments I do not imply that cessationism is necessarily false. I think it is, but that’s not the argument in question. Deere’s most important chapter is “The Real Reason Christians Do not believe in the miraculous Gifts” and in it he undoes a number of cessationist non-arguments. False Assumption 1: NT Healing was “Automatic,” meaning the NT Christian could heal anyone at anytime. But the NT never claims this and makes statements that are quite odd if true: “And the power of the Lord was present for him to heal the sick” (Luke 5.17, quoted in Deere, 59). If Jesus could heal “any place, any time,” then why did Scripture mention the power of the Lord being present? Why at some places does Jesus heal all yet at Bethesda he only heals one person? In fact, at Nazareth Jesus did not do many miracles there because of their lack of faith” (Matt. 13.58). Finally, the answer is that the NT does not see spiritual power as “automatic.” Jesus gave the apostles all authority over demons and sickness (Matt. 10.1; Luke 9.1), yet they could not heal a demonized boy (Matt 17.16). What gives? I thought healing power was automatic? Obviously, the cessationist is wrong. Not surprisingly, there wasn’t a chapter on basic logic in this book. Thesis: “It is the elevation of experience over the authority of Scripture that grieves and demeans the Holy Spirit most of all” (Macarthur 17). I have several observations: 1) it is dangerous to elevate experience over theology, but where is the proof that it grieves the Holy Spirit most of all? How does Macarthur know this? The Scriptures he cites are about the Holy Spirit’s inspiring the Word and the Spirit’s testifying to Christ. Great, but that is immaterial to this thesis. Indeed, is this not Macarthur’s own experience? 2) If this is Macarthur’s thesis, and if he is successful in proving it (I don’t think he can be), then we should note that the truth of continuationism stands or falls independent of this thesis. I really don’t know what to say. I suppose some early Pentecostals said something like this. At this point I have no idea if this historiography is true. I am not persuaded that one can make a 1:1 connection between the early Pentecostals and Wayne Grudem. Genealogical arguments are always dangerous to make and they rarely deliver on their promises. Most of this chapter reads like the tabloids. Interesting, mind you, but not really germane to the thesis, except where noted above. Macarthur has a twofold argument: the apostolic office has expired, and if the apostolic office expired, then other gifts may have expired (MacArthur 91). He further argues, “The Charismatic movement operates on the premise that everything that happened in the early church ought to be expected and experienced in the church today” (91). I agree with Macarthur’s definition of apostleship, but I dispute the conclusions he draws from it. Quoting Sam Storms, he says, “But even he [Storms] acknowledges that ‘since no one today can meet the qualification of having seen the risen Christ with his own eyes, there are no apostles today’” (93). If Storms is correct, and I think he is, and if Macarthur thinks Storms is correct, and I think he does think that, then Macarthur has just contradicted his earlier statement on page 91 that the Charismatic Movement operates on the premise that everything” is in effect today (emphasis original). We can leave that contradiction aside for the moment. Macarthur’s real target is Peter Wagner. I don’t feel a need to defend Wagner, so I’ll move on. Macarthur argues that “The New Testament apostles were recognized as the revelatory agents of God, and as such they possessed an unsurpassed level of authority in church history” (94). This is a good statement and I think it lends evidence to the claim that prophetic words of wisdom are not in the same category as Scriptural revelations. This is the toughest objection and where Macarthur is initially on stronger ground. Mind you, this objection, if it carries, presents a huge difficulty for continuationism but it does not prove the book’s thesis. Before we answer the question whether prophecy can be fallible, let’s ask if it is always authoritative? Presumably, the cessationist would answer “yes.” We’ll come back to that. I think both sides are confusing an issue. Divine prophecy itself is always infallible because it comes from God, but does that mean that the prophet is always giving divine prophecy? Could he just be mistaken? Macarthur is quick to respond that false prophets in the Old Testament should die. Well, yes, because their false prophecy almost always involved going after other gods. Still, the cessationist will urge that the Bible said fallible prophets should die. Okay, let’s reread some of Paul’s statements, like in 1 Corinthians 14: “Earnestly desire to prophecy but if you get it wrong I will kill you.” The text just doesn’t read that way. I think something else is going on. The real question is this: Is prophecy-in-the-church always binding on me? Surprisingly, the answer is no. This leads us to the Agabus case (Acts 21 passim). Let’s grant Macarthur his point that Agabus prophecied with 100% accuracy. Here is the problem: Did Paul sin in not obeying Agabus? I don’t know of anyone who says he did. One more point: if we should always expect prophets to be 100% accurate and if prophets are giving forth potential-Scripture, then why does Paul tell us to test the prophecies (1 Cor. 5:21)? If it is a divinely binding Revelation, you should not test it but obey! The first and most obvious criticism is Macarthur’s oscillating thesis. From earlier in the book he appeared to attack the elevation of experience over theology, which thesis is independent of whether the gifts continue today. So even if his thesis is successful, he has not disproven continuing gifts. Much of the book, however, is either a running catalogue of charismatic abuses or it is a comparison of all forms of Charismatic theology with cults like Mormonism. Macarthur’s account suffers from a number of either misleading statements or theological inaccuracies. These errors aren’t serious enough to refute the whole book, but they are worth pointing out. I think at best they show that Macarthur’s arguments aren’t serious enough to fully take down the continuationist thesis. What makes a book canonical? Or rather, what gives it apostolic authority? Macarthur answers, “If a book or epistle claiming to speak with prophetic authority was written by an apostles or under apostolic oversight, it was recognized as inspired and authoritative” (95). Please note that Macarthur gives at least two necessary conditions for canonicity: 1) prophetic authority AND 2) apostolic connection. (1) isn’t the issue under question, which makes (2) the clincher. Here is the problem: who wrote Hebrews? This is where Roman Catholic and Eastern Orthodox apologists have a field day with us, and who can fault them? On another point, if the canon is “closed” today, then how do you know it is closed? Mind you, I think the canon is closed for all functional purposes, but I don’t see how you can have fully epistemic confidence it is closed. Which book of the Bible says it is closed? Revelation 22 doesn’t count, because it’s just talking about Revelation (and this is a bigger problem if you accept an early date for Revelation). If you can’t prove the canon is closed from Scripture alone, which is impossible to prove, then you can’t prove beyond a shadow of a doubt that people are adding to the canon. Macarthur defines sola scriptura as “the only divinely revealed word and therefore the believer’s true authority for sound doctrine and righteous living” (214). This is a half-truth. For the Reformers, Scripture was first of all the norm that normed lesser norms. It is not the only source of truth, but the final source of truth. Speaking of the charismatic movement, he writes, “The entire movement is nothing more than a sham religion run by counterfeit ministers” (113). Yikes. The entire movement? How do you get from cases like Oral Roberts and Benny Hinn and then derive a universal statement from them? This would fail a freshman logic class. And then we have basic, old-fashioned “begging the question.” He writes, “It is also important to remember that Paul wrote these words [1 Thess. 5:20-22] at a time when the revelatory gift of prophecy was still active” (126). He is using this to explain away Paul’s command not to despise prophetic utterances, but he is assuming the very thing he is trying to prove. Speaking of miracles and healings, Macarthur asserts (not argues!) “Such biblical-quality healing miracles are not being performed today” (175). So what of sane, sober accounts where people were healed? Macarthur, like David Hume, would simply say that’s not possible. Don’t let facts get in the way of theory. Macarthur: “There is no warrant anywhere in Scripture for Christians to listen to fresh revelations from God beyond what he has already given us in his written word” (115). The Apostle Paul: “especially that you may prophesy” (1 Cor. 14:1); “desire earnestly to prophesy” (v. 39). Cessationists use “revelation” in an equivocal sense. This is a problem when we examine practices in the 1st century church. Paul tells the church to prophesy (and one can find numerous other examples). How does the cessationist respond? 1: God’s speaking is what constitutes revelation, and revelation was eventually codified in the canon. 2: The canon is closed (let’s leave aside messy issues like who had the authority to close the canon and how do you know). 3.1. Prophets aren’t around, either. Is (P1) true? I agree with the first half if it is phrased like this: God reveals himself and this usually happens by speech or in words (whether internal or external). The second half of P1 is unproven. What about P2? Practically, we have to assume that the canon is closed, but we have no evidence from God that it is. Honestly, how do you know the canon is closed? I think wiser Protestants were right to say that the Canon is “a fallible collection of infallible books” and leave it at that. As to P3, my question is: are all acts of “prophesying” in the New Testament establishing the foundation of the church? Are Phillip’s daughters part of that foundation? When Paul acknowledges different men are prophesying is that, too, part of the foundation? Maybe, but we have no evidence that such is what Paul meant. P4: Paul’s command to prophesy only functioned until the canon was closed. Not all of the book is bad. The sections on the Holy Spirit and Sanctification were quite good. Unfortunately, Macarthur engages in huge leaps of logic, misleading statements, and unfocused arguments. I think this is the end of cessationism.